Phil Donahue, one of the best-known talk show hosts in U.S. television history, his show was on the air for more than 29 years. In 2002, he returned to the airwaves, but he was fired in 2003 on the eve of the war by MSNBC because he was allowing antiwar voices on the air. Along with Ellen Spiro, he directed the documentary, Body of War, which tells the story of Tomas Young, an Iraq War veteran paralyzed from a bullet to the spine. Now, at the age of 33, Tomas has decided to end his life. Tomas Young, Iraq War veteran and the main subject of the documentary, Body of War. On April 4, 2004, his fifth day in Iraq, Young’s unit came under fire in the Sadr City neighborhood of Baghdad. Young was left paralyzed, never to walk again. Released from medical care three months later, Young returned home to become an active member in Iraq Veterans Against the War. He recently announced that he will stop his nourishment, which comes in the form of liquid through a feeding tube — a decision which will hasten his death. 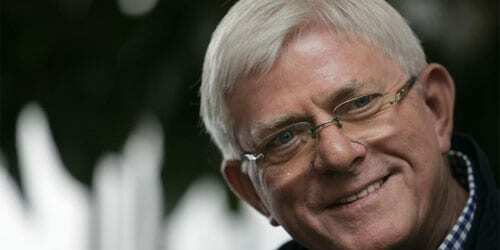 In 2003, the legendary television host Phil Donahue was fired from his prime-time MSNBC talk show during the run-up to the U.S. invasion of Iraq. The problem was not Donahue’s ratings, but rather his views: An internal MSNBC memo warned Donahue was a “difficult public face for NBC in a time of war,” providing “a home for the liberal antiwar agenda at the same time that our competitors are waving the flag at every opportunity.” Donahue joins us to look back on his firing 10 years later. “They were terrified of the antiwar voice,” Donahue says. JUAN GONZÁLEZ: Phil, I’d like to bring in another subject in terms of this whole issue, the—what happened to you, directly, as a host on MSNBC in the midst of the run-up to the war, and the responsibilities of the press in America and its—the mea culpas that have rarely been uttered by the pundits and by the journalists over what the American press did in the run-up to war. PHIL DONAHUE: Well, I think what happened to me, the biggest lesson, I think, is the—how corporate media shapes our opinions and our coverage. This was a decision—my decision—the decision to release me came from far above. This was not an assistant program director who decided to separate me from MSNBC. They were terrified of the antiwar voice. And that is not an overstatement. Antiwar voices were not popular. And if you’re General Electric, you certainly don’t want an antiwar voice on a cable channel that you own; Donald Rumsfeld is your biggest customer. So, by the way, I had to have two conservatives on for every liberal. I could have Richard Perle on alone, but I couldn’t have Dennis Kucinich on alone. I was considered two liberals. It really is funny almost, when you look back on how—how the management was just frozen by the antiwar voice. We were scolds. We weren’t patriotic. American people disagreed with us. And we weren’t good for business. This entry was posted on March 22nd 2013 at 8:54pm/20:54 and is filed under Live News Column 1, Live News Column 2, Politics. You can follow any responses to this entry through the RSS 2.0 feed.